How many times have you seen ad agencies advertise that they can help you “develop a killer marketing strategy”? (For some reason, “killer” is a frequently-used adjective in this context, but moving on.) Hearing that you should have a marketing strategy, but not knowing exactly what that entails, can certainly invoke a bit of anxiety. We’re here to help ease your concerns. 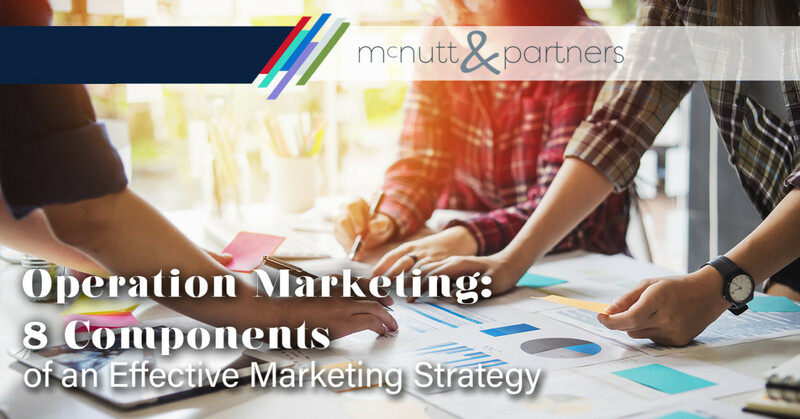 The components of an effective marketing strategy are concepts you are likely already familiar with. Put simply, a marketing strategy is a plan of action. It is a means to an end—a set of actions leading up to a goal or set of goals in regards to advertising. In other words, if you’ve got goals for your brand or business, a marketing strategy is a research-based, organized plan for setting those goals in motion. Why is having a marketing strategy important? Defining marketing strategy also involves taking into account your audience and its needs. A marketing strategy serves to identify your target audience and outline how your marketing messaging is going to appeal to your audience’s needs. Without strategy, you might as well be throwing wet noodles against a wall to see what sticks—and with oodles of competition out there, you can’t afford to be throwing wet noodles. Developing a marketing strategy will help to keep you focused on your objectives—and the tactics involved in reaching those objectives. All of this is in an effort to make sure you get what you want out of your marketing efforts with the overarching goal of seeing your brand thrive. A marketing strategy can ultimately save you money—so you are not wasting your time and money on futile efforts. What does a good marketing strategy include? Target audience. Before you craft your marketing messaging, and before you decide how you’re going to put it out there, you need to know who it is that you are talking to. Just like you might talk differently in a business meeting than you would on a Saturday out with friends, the theme of your marketing messaging—and the way it’s delivered—depends on who is on the receiving end. You can define a target audience for a particular campaign, or define one for your marketing strategy overall—as long as you make sure you are marketing to people who are actually (potentially) interested in your product or service. Market assessment. Examining market dynamics is another among the components of an effective marketing strategy. Once you know the types of consumers you want to pinpoint, you need to examine trends happening within those respective markets. For example, look for opportunities in the marketplace where consumer needs are not currently being met, and focus on solutions in those niches. Awareness of the competition. The goal is to always be ahead of the competition, so you don’t know where “ahead” is unless you do your research. Study what your rivals are doing in order to position yourself optimally in the market. The idea here is to determine what you can be doing differently than other brands in your market, not to replicate what they are already doing. Objectives—short and long-term. We all want to strike it rich and retire happy. But when it comes to components of an effective marketing strategy, we need to be a little more specific. Short-term goals could include generating leads, growing social media following by “X” amount or increasing website traffic. Long-term goals are the results of achieving short-term goals, and can include items like enhancing overall brand awareness, improving your Google search ranking or cultivating a positive brand reputation via positive reviews. Everything your marketing strategy encompasses serves to make these goals a reality. Multiple marketing channels. Hand-in-hand with what your content is saying is how you are putting it out into the world. Your marketing strategy should detail what marketing channels you will use to disseminate information. Your content should exist on multiple platforms, which may include social media, websites, apps, or traditional marketing means like print and out-of-home (OOH) advertising like billboards or signage. Timeline for execution. Creating a timeline for executing your marketing strategy will help you stay on task with the steps you’ve outlined to meet your goals. Having a specific timeframe in mind is also inherently necessary for goal-setting, as goals typically include having “X” activity done by “X” amount of time. A budget. Thinking about money is never the fun part, but budgeting for your marketing strategy will ultimately help you save in the long run. It will prevent you from overspending on potentially ineffective efforts—especially if you do all of your research first. We know—all of these components of an effective marketing strategy can seem overwhelming. If that’s the case for you, then enlist some help! McNutt & Partners is a full-service advertising and digital marketing agency. Contact us today for your marketing needs! Call 334-521-1010, or visit our contact page.